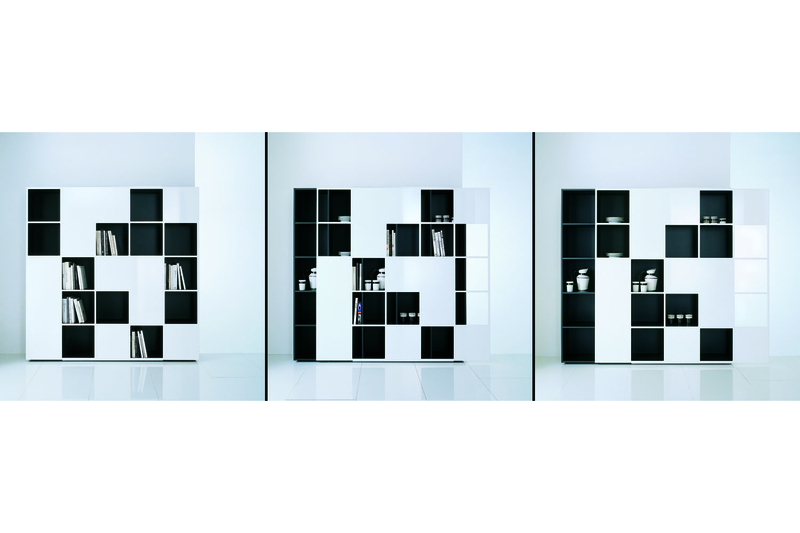 Cabinets characterized by one single door, as large as the whole front side of the unit, whose surface is interrupted by wide square openings disposed in an apparently casual sequence. This creates closed and open spaces, pointed out by evident profiles reminding the back structure and hiding it at the same time. The door slides in both directions until it juts out of the unit for 40 cm. opening all the previously hidden compartments. STRUCTURE AND SURFACES: Chipboard panels with embossed polyurethane varnish. DOORS: Setapan sheet, thick acrylic material, with high quality polished gloss surface. SLIDING MECHANISM: Drawn aluminium guides with nylon-coated steel bearings and thick sheet steel supports. Embossed polyurethane varnish.